1.Adjust oven rack to lowest position. Preheat oven to 350°. Place roasting rack in large, deep roasting pan. In small bowl, stir butter, 1-1/2 tablespoons sage, garlic powder and pepper. 2.Remove giblets from turkey cavity; discard liver. Loosely add stuffing to turkey cavity. Place turkey, breast side up, on rack in pan; brush with 1/4 cup butter mixture and sprinkle with salt. If not already secured, tie legs together with kitchen string; tuck wing tips under turkey to hold in place. Add 6 cups broth to roasting pan; tent turkey loosely with aluminum foil. 3.Roast turkey 2 hours. Remove foil and brush turkey with remaining butter mixture; add 1 cup broth to pan. 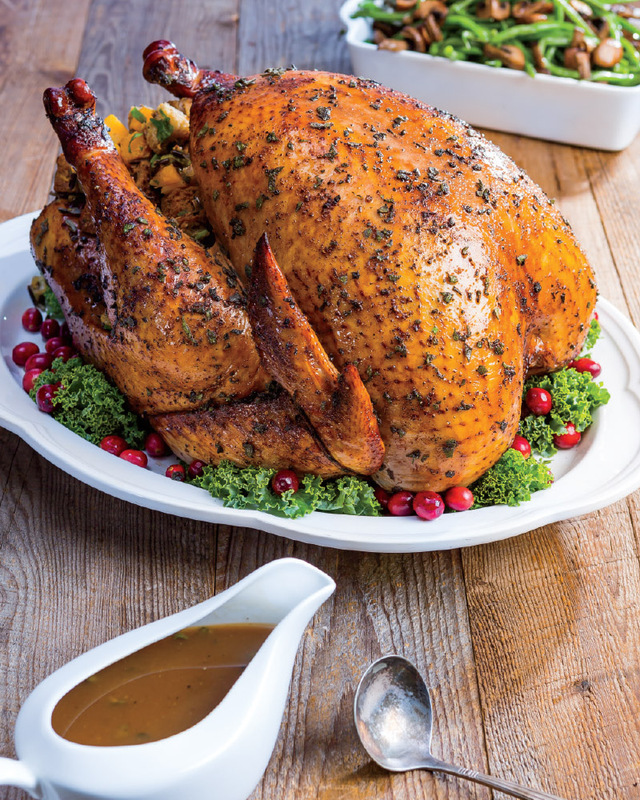 Roast turkey 45 to 55 minutes longer or until juices run clear and internal temperature reaches 160° in thickest part of thigh and in stuffing, making sure thermometer doesn’t touch bone. Transfer turkey to cutting board; loosely cover with aluminum foil. 4.Remove rack from pan; with spoon, skim excess fat from drippings. Place roasting pan with drippings over medium heat. Whisk in flour; add remaining 1 cup broth and heat to simmering, stirring to loosen browned bits from bottom of roasting pan. Simmer 5 minutes; whisk in sherry and remaining 1-1/2 tablespoons sage; simmer 8 to 10 minutes longer or until gravy thickens, stirring occasionally. Makes about 5 cups. 5.Carve turkey and serve with Sage Gravy. If you don’t have a roasting rack, place giblets in roasting pan, then place turkey directly on giblets. > Hosting for the holidays? Plan for 1 pound of turkey per person; this will ensure that you have enough (and have extras for those turkey sandwiches!). If you purchase a frozen turkey, plan to defrost ahead of time in the refrigerator on a clean tray. Plan for 24 hours per 5 pounds.